I'm trying to do my first HDR calibration using HCFR. I have a Panasonic OLED FZ950/952. I've read a lot of threads and find the information all over the place for a novice. 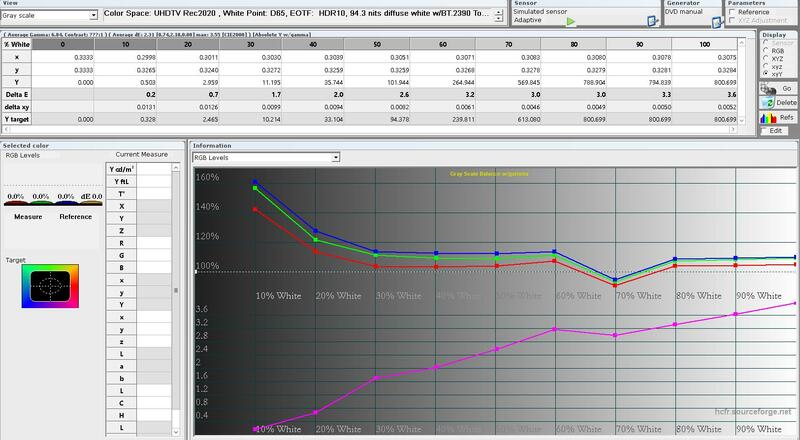 3 - The only settings that produce any change in those readings are the cutoff adjustiments in 2-point WB. Gain, 12-point WB, CMS and gamma I get nothing. - What I'm doing wrong? I can't figure out the steps I should take to do the calibration. - Should I calibrate CMS or not? First, ensure you are sending an actual 10% HDR10 box, using MadVR or similar, and select MadVR in the generator option menu where you find the HDR10 checkbox. 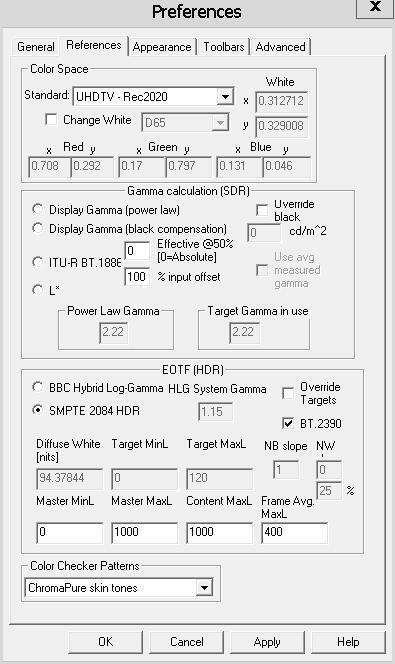 Second, instead of looking at RGB, select luminance - gamma (absolute Y), so you can see the brightness curve, then do your 10 points at each point using continuous measuring...just bump each R G and B until you match the RBG value and luminance requested by HCFR. You can view R G and B on the luminance graph if you wish. Maybe do 2 point at 80%, then 30%, before moving on to 10 point and start at 10% and work your way up the scale. Around 60-70% you will have weirdness as it tries to roll off the highlights. Might also consider Content MaxL at 2000 or 4000, since that is what most movies are mastered at. MaxL of 1000 would make everything in the midtones brighter and the whole HDR effect less contrasty. ChavesBR and mrtickleuk like this. The problem I'm having is that changing the TV settings does nothing to the curve, even luminance, except the case I mentioned before. The content settings are the ones that appear on the patterns. Tri-linear interpolation. The Blackmagic Teranex mini is the only LUT box I know of that is using Tetrahedral interpolation ( Resolve has it as an option also in software). Tetrahedral LUT Interpolation is coming soon as a free firmware update for FSI BoxIO LUT Box also.